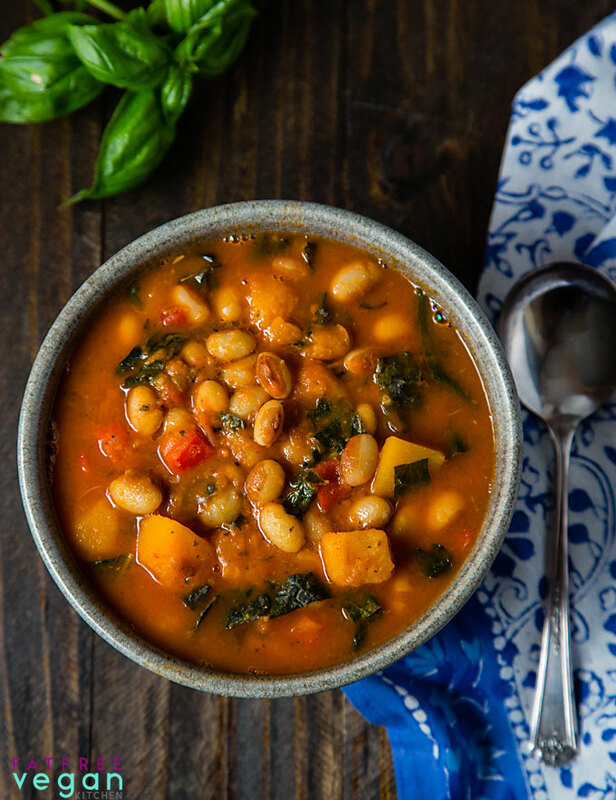 Based on the Chilean Porotos Granados, this vegan white bean stew includes butternut squash, kale, and fresh basil for a hearty and flavorful one-pot meal. First, let me just say–Ouch! That pound of beans cost me $7-something plus tax. 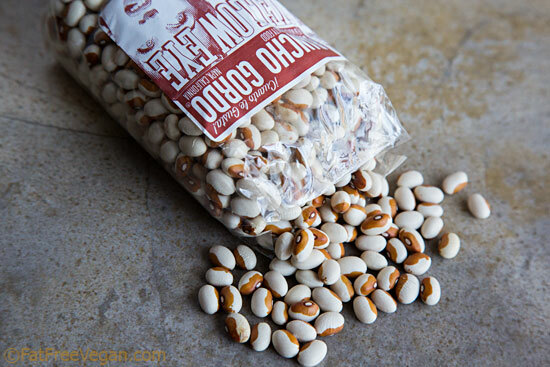 Regular old navy beans in Kroger cost less than a dollar a pound, and if I think too long about how many bucks I could be saving for my daughter’s education, I’d never buy fancy beans again. But these beans were very good–they cooked quickly in the pressure cooker, became tender without falling apart, and, most importantly, are organically grown. I won’t be shelling out the big bucks for them every day, but I was happy with their flavor and eager to try some of Rancho Gordo’s other varieties. 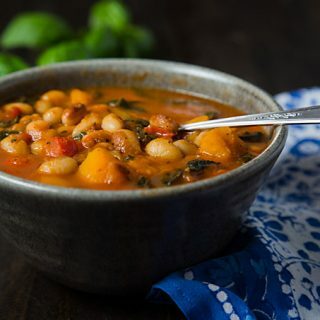 For my first foray into fancy-bean territory, I made a relatively simple stew modeled on a traditional Chilean dish called Porotos Granados, which is usually made with fresh cranberry beans and topped with a pesto-like mixture of herbs (cilantro, basil, parsley) and hot peppers called pebre. To me, the one ingredient that makes the flavor of porotos granados different from other South American bean stews is the fresh basil, so I wanted to try a variation of it while my basil plants were still thriving. Because I like to make everything I can a one-pot meal by adding veggies, I threw in a bunch of lacinato kale. I skipped the pebre (many of you know my intolerance for cilantro), increased the seasonings significantly, and served it with some Tabasco garlic sauce. The results were encouraging: My husband loved it, I really liked it, and my daughter E (who currently claims to hate white beans and squash) ate it under protest and thought it contained too much basil. Since I’ve given up on E loving anything but pasta, I consider that a success. The time it takes to cook beans is affected by the type and age of the beans and possibly the hardness of your water and your elevation. I made this in the Fagor Multi-Cooker pressure cooker using yellow-eye beans, so the times below reflect that. You may need to add a few more minutes to get the beans fully cooked. If you’re not using a pressure cooker, see the instructions in bold. Make sure to rinse your beans first and check for rocks and then soak overnight in cold water. Or do a quick soak by boiling the beans in enough water to cover by an inch for one minute, and then cover and allow to stand for at least an hour. Drain before proceeding with the recipe. Heat a pressure cooker or large Dutch oven. (In an electric pressure cooker like the Instant Pot, use the Sauté or Brown setting.) Add the onions and a pinch of baking soda (optional but speeds up the browning). Cook until onion is soft and beginning to brown. Add the garlic and cook for another minute. Add the beans, water, 2 teaspoons paprika, 1 teaspoon oregano, 1 teaspoon cumin, and dried basil to the pot. If pressure cooking, seal your cooker and bring to high pressure. Cook at high pressure for 8 minutes; then perform a quick release. (Choose the Pressure Cooker or Manual setting on your electric pressure cooker and set the time to 8 minutes; release the steam when the time is up.) If cooking in a regular pot, bring to a boil, reduce heat to a simmer, cover and cook until beans are just barely cooked all the way through, 30 minutes to 1 1/2 hours. Check pot occasionally and add more water to cover the beans if it seems low. Add the squash along with the remaining seasonings, peppers, tomatoes, and salt, if using. Seal the cooker and cook at high pressure for 8 more minutes. Let pressure come down naturally; after 15 minutes, quick release pressure if necessary. For stovetop cooking, add more water if necessary to cover all ingredients. Cover and simmer until beans and squash are very tender. Check the seasoning and add more cumin, oregano, or salt to taste. Add the kale and corn and simmer, covered, until the kale is tender. Stir in the basil and cook for another minute before serving. Tip: If you have a microwave, you can make the squash much easier to cut by microwaving it for a couple of minutes on high power. This is a zero-points meal on Weight Watchers Freestyle program. I have no affiliation with Rancho Gordo and have not received any compensation from them. However, this post contains Amazon affiliate links to products I like. When you buy something through them, I receive a commission that helps support this site at no cost to you. Thanks for your purchase! Another hearty one. I look forward to trying this one out! We made this soup today, it was HEAVENLY. We used canned white beans and it all cooked up wonderfully. And even without the squash, which I didn’t have on hand, it was very filling. Love the spices! The smoked paprika turns this into super duper comfort food soup YUMMY! I have recently watched the documentary Vegicated. I Have been contemplating slowly turning my family from average meat with every meal family to fish, eggs and dairy to vegan. I have no idea how to go about this change. I was looking up recipes to help shed some too busy to prepare and eat health weight I have put on the last 6 months about 30(I know it’s shameful). So I came across your website. Can you suggest an easy transformation approach or and idiots guide to Vegan book I can look up. Thank you so much for your help. Sounds like Autumn to me……. thank you for sharing ! I just bought an electric pressure cooker at costco and am excited to start using it. Can you please explain what it means to let the pressure out naturally versus forcing it? With ours, you turn a knob on the top to lock it while cooking, and then you turn it to release the steam when you are done cooking, and I think those are the only two options. I am looking forward to trying your recipes, they look delicious! Hi Michele, a quick release is when you turn that knob to release the pressured all at once. Natural release means that instead of turning the knob, you turn off the cooker and as it cools off, the pressure goes down naturally. In “the old days” of stovetop pressure cookers, that took about 15 minutes, but with these electric cookers being better insulated, it can take longer, so usually after 15 minutes of sitting there unplugged, we turn the knob to release whatever pressure is left and call it a natural release. I hope you enjoy your new cooker as well as some of my recipes! OMG! I have made about a dozen recipes from your site and this might be my favorite – not too spicy, very light. It is exceptional and so healthy tasting. I also picked a random bean since I did not see the one you listed. 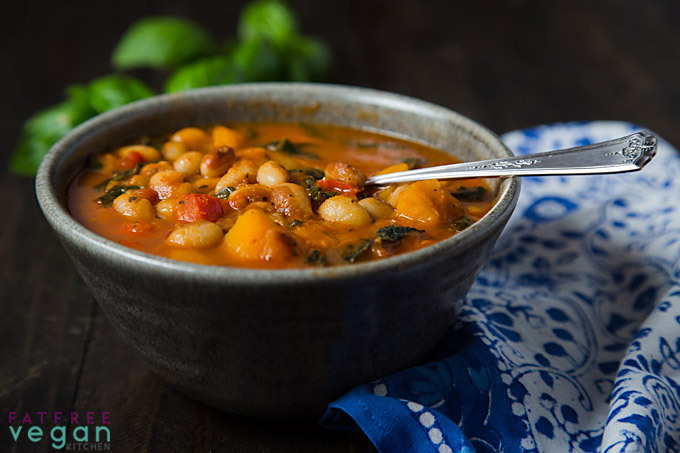 Still so amazing – and I used kabocha squash. Incredible! I’m so happy you liked it so much! Cindy S did you rinse the canned beans. Cindy S. , How long did you cook the beans? I using a regular pot. 2400 calories for the recipe?? I have it as 383 per serving or 2298 for the entire pot. This recipe was a winner in my family. I made it with yellow-eye peas, butternut squash and corn. Instead of adding fresh basil to the soup, I made pebre sauce (found through the link) for garnish. Pebre sauce is awesome! It made this soup sooo good! It was a lot of ingredients to chop and prepare, but it was worth it.